One of the pilots of the BSF’s Air Wing has written to its top brass, alleging that like Rijiju, several VIPs, including Home Minister Rajnath Singh, have been flying in unsafe conditions, with uncategorised pilots flying VIPs, aircraft not being maintained properly. 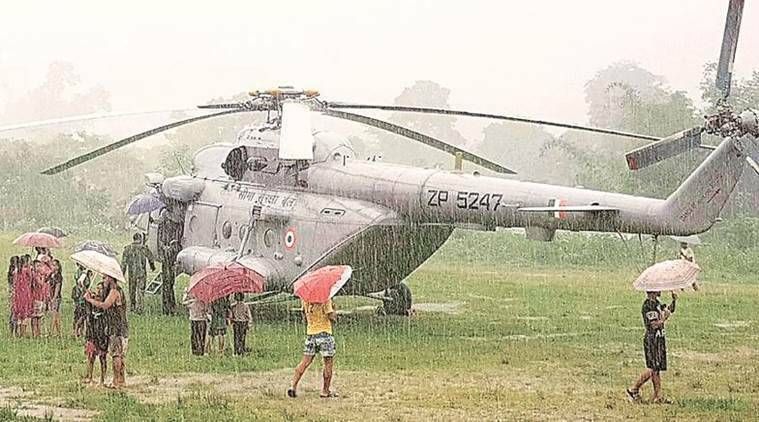 On July 4 this year, MoS Home Kiren Rijiju had a narrow escape when his Mi-17 helicopter made an emergency landing in Arunachal Pradesh due to bad weather. Rijiju thanked the pilots for saving his life. What he didn’t know, perhaps, was that one of the pilots flying him was an uncategorised (or trainee) pilot. Now, one of the pilots of the BSF’s Air Wing has written to its top brass, alleging that like Rijiju, several VIPs, including Home Minister Rajnath Singh, have been flying in unsafe conditions, with uncategorised pilots flying VIPs, aircraft not being maintained properly and standard operating procedures of flying and safety not being followed. The BSF Air Wing has eight Mi-17 V5 choppers and an Embraer, largely to fly VIPs and for rescue of injured personnel during anti-Naxal operations. The letter, written by Wing Commander Yogesh Kumar Daksh, has pointed out that since June 2015, not a single flight safety meeting has been held, the Air Wing does not even conduct pre-flight medical check-ups of pilots and, in the name of base operations, it has a telephone operator doubling up as control room. The letter dated August 15 is addressed to the BSF’s IG (Air) and points out that the choppers are registered under military rules and fly under SOPs issued by the Indian Air Force. “In the last few months it has been observed that there has been gross dilution in adherence to these orders and SOP. This trend may lead to serious accident/incident, jeopardising the life and safety of the aircrew and passengers involved in flying,” says the letter. It points out a serious safety issue when it says that the BSF Air Wing does not have a single Infra Red (IR) Flare to thwart being targeted by missiles. “The BSF Air Wing is not even holding a single IR flare on its inventory and the helicopters are frequently tasked to fly without IR flares fitted, even at times with VIPs on board,” the letter says. IR flares are used as a protection against heat-seeking missiles. They are released to divert an incoming missile. A BSF Air Wing officer, however, played down the concern, saying such threats are anticipated in situations of war and it was unlikely the home minister’s chopper would be targeted by a missile while flying inside the country. “But yes, it’s a precautionary measure which would not be bad to carry while flying in Kashmir. But all this costs a lot of money and resources are limited. We have to manage in the funds we have,” said another BSF pilot. On pilots, the letter said the “aircrew are frequently tasked to fly with uncategorised pilots”. Besides the Rijiju incident, the letter mentions that a year ago, on October 2, 2016, when the Director General of the Bangladesh Rifles or Border Guards Bangladesh was on a visit to India, he was flown in a chopper where both the pilots were uncategorised. Sources said there are various categories of pilots ranging from A to C. An uncategorised pilot is as good as a trainee as he cannot do “instrument flying”, which means he can only fly with the aide of sight. A senior BSF officer, however, said the uncategorised pilot who flew Rijiju on July 4 had five years of experience in flying and so could not be called “unsafe”. “But yes, we do have a problem of crew. We don’t have enough people. And so we have to make do with uncategorised pilots,” the officer said. The letter also points out there is no operations base at Safdarjung airport in Delhi. “There is a telephone operator in the control room at SAP, Delhi who is clueless about the aircrew and flying requirements,” the letter says. The letter also says the aircraft are lacking in maintenance. It says while there are technicians to maintain engine and airframe, all supervisors sit in Delhi. An Air Wing source said that this was because, of the three air bases at Ranchi, Guwahati and Delhi, everyone wants to stay in Delhi. “There is no reason for four supervisors to sit in Delhi. During emergencies, will they run to Ranchi and Guwahati?” asked another pilot. A senior Air Wing officer, however, said the infrastructure at Ranchi and Guwahati are not fully developed and so large-scale servicing was not being done at these bases. A senior BSF AIR Wing officer said a lot of these complaints were being made because the Seventh Pay Commission had removed flying incentive for pilots.